MyBinding.com has a new product line called foil printed covers. Convey an image of professionalism by adding a foil printed logo on a variety of covers covers in multiple foil colors and finishes. Imprintable covers are designed to be printed on with a standard laser or inkjet printer. Browse our selection of imprintable covers and customize the look of your presentation. Binding your project with a hard cover is a great way to make sure it stays protected and looks great. Browse our selection of hard covers below. Give your project or document the appearance of a professionally bound document and at the same time securely hold all your hard work, while lasting through some serious use. Thermal binding is a fast and easy way to make professional looking documents. Browse our selection of thermal binding soft covers to find the right one for your project. If you're looking for a fast and easy way to bind reports, then check out our selection of report covers. You have a binding machine and documents to assemble, now what? Choosing your covers is the next step in the binding process. There are many options, so take a few minutes to familiarize yourself with the choices so you can be sure to choose the right one for your project. One main factor will be the size of your project. 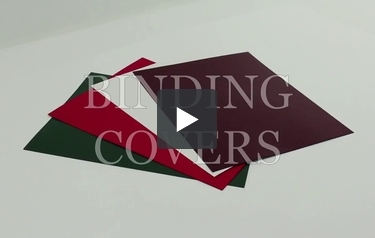 Standard binding covers come in letter, legal, half, oversize, index, and ledger sizes. Not all styles come in all sizes, so it's important to pay attention if you need a specific size. If you want to save time, you can order your covers prepunched in a variety of styles. We can even add windows to your covers to let the title show through. The biggest deciding factor for choosing covers is the look and feel. Depending on your choice, your finished document can convey varying degrees of professionalism, from casual all the way up to formal bound books. Clear covers, one of the most popular choices, come in a variety of thicknesses and are ideal for companies wanting a customized look. They allow you to protect the contents from spills while showing your title page. If you like a more opaque look, try Frost Poly covers for the same strength and durability as clear covers with a more refined look. They are tear-proof and treated for silk screen printing and foil stamping, allowing you to add custom graphics. Frost Polly covers also come in an eco-friendly version. Regency and Composition covers provide a premium leather-like appearance for your materials. Made from heavily coated paper stock, these covers offer excellent quality and durability. Similarly, Linen Weave covers are made from 80lb cover stock. Grain paper binding covers have a similar look and feel as Regency covers; the only difference is that grain covers aren't coated, so they don't have the same durability and protection as the others. Twill covers are another option with a raised finish. Any of these options will give your documents a professional and elegant appearance. Cardstock covers add a bit of fun to a report or proposal, especially if you choose one of the many charismatic colors. They can be custom made from any color into any size. You can also save time and money by having us prepunch them so they'll be ready to go. For a glamorous look, try a Metallic Cover. These elegant covers are available in over a dozen colors and virtually any size, including custom sizes. They are made from heavyweight stock and feature an exquisite sparkling metallic finish on both sides to make your project stand out. Customize these further with foil, offset printing, embossing, or debossing. We've mentioned a few that are compatible with printing and other custom work. However, you shouldn't assume that all covers can be used with your printer. Laser and Inject Imprintable covers come in a wide variety of colors, textures, and and work with your printer to create a finished project. Make sure you consider your printing needs before you purchase covers. There are also a number of cover selections made from Polyethylene that come in a variety of finishes. Most of them are a quality, tear-proof option for binding. Sand Poly covers are 12mil and have an elegant sand-like appearance. Leather Grain poly covers look like leather but as their name implies, they are made from 16mil poly. A unique diagonal strip pattern set the transparent Striped poly covers apart from all the rest. Crystal Embossed Poly covers are embossed with a unique diamond pattern for an eye catching result. And finally, Holographic Poly covers have a 3D appearance and a semi-transparent finish so your cover page shows. Overall, poly covers offer durable protection from spills and the elements. Binding bars and report covers are exactly how they sound. They work in conjunction to provide a way to secure pages together without requiring punching or permanent adhesive. Report covers are always clear and come in a standard letter size. Simply insert your materials into the report cover and slide the binding bar along the edge. Your contents are firmly held in place for a quick, on the go bind with no fuss. Fastback binding covers work specifically with Fastback machines. These come in a large array of styles, allowing you to achieve the perfect look for you documents. We carry heat-resistant clear covers, Halfback binding covers, Foilfast composition covers, and more. We also have Fastback Hard cover cases and Photobooks. Beyond just Fastback, we have Hardcovers that work with other machines as well, giving you the ability to create your own perfect bound books and yearbooks using one of several different machines. You could even create your own by using thermal bind strips. These strips can also be used to repair old books that have pages falling out. Not seeing something that works for you? We also carry a selection of specialty covers, including Fibermark's Touche that has a silky soft texture. Vinyl binding covers are a good choice if you need a soft and pliable book. Recycled Chip Board covers are made from 100% recycled material for an eco-friendly option. These add rigidity to your project and are often used on the back of notebooks. They require a heavy duty punch, so you may want to consider ordering them prepunched to avoid this step. They can also be wrapped, painted, or die cut stamped and come in virtually any size. If you are on the go and your documents take a beating from the weather, you might try using synthetic paper. Synthetic paper offers exceptional protection against wear, damage, and the elements as well as a smooth finish. Waterproof and tear-proof, it is perfect for signage or heavy handling. Don't need to bind a document, just looking for a way to contain your report? We have you covered there as well. Report covers and Portfolios help give your materials a professional look and come in a variety of styles, including quick edit covers, executive portfolios, tri-fold portfolios, and more. Did you know Powis not only creates Fastback covers but iCases as well? Keep your iPad safe and stylish in one of these unique cases. Powis iCases are designed to protect against weather, damage, and general wear. No matter your activity, a Powis case is sure to offer comfort in one of its nine positions. Find a beautiful design among our selection of leather and patterned cases. If you've made it this far, your brain is probably swirling with information overload. Don't try to analyze it too closely. Call us and we will help guide you to the right covers for your project. Welcome to MyBinding video. If you need covers, we’ve got you covered. But you knew I was going to say that. At MyBinding.com, we strive to have everything that you need – standard, custom, colors, styles – we have in stock every approach you could want. If you need the linen look, we have every color and we can cut in any size you need. For grain, same thing – all the colors and all the customizations. Clear covers are our most popular selling binding cover, and we can customize them with any punch pattern, any thickness from 4 to 20 mil, any size, and every sheet in our packet come with an insert to keep them protected. We can print or emboss anything and cut windows into everything. We can even cut rounded corners for you. Just go to our website, you’ll see pull down menus of every kind of customization. Select the covers tab and you can see our endless selection. You’ll find plenty of ideas as card stock, eco-friendly, fast back covers. We even have iPad cases, printable inkjet thermal covers, frost poly-covers, metallic regency and twill, and there’s plenty more where that came from. Give us a call or a click. MyBinding.com.